The German philosopher Karl-Otto Apel died on May 15, 2017. He was 95. New book by Habermas: "Philosophical Introductions"
"Philosophical Introductions: Five Approaches to Communicative Reason"
On the occasion of Habermas’s 80th birthday, the German publisher Suhrkamp brought out five volumes of Habermas’s work - "Philosophische Texte" - that spanned the full range his philosophical work, from the theory of rationality to the critique of metaphysics. 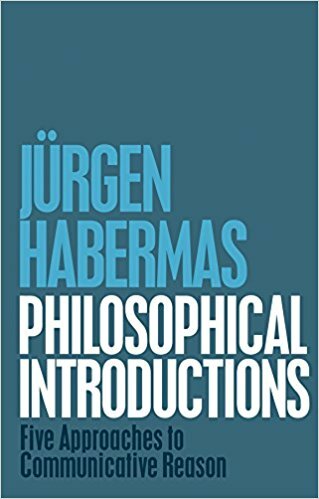 For each of these volumes, Habermas wrote an introduction that crystallized, in a remarkably clear and succinct way, his thinking on the key philosophical issues that have preoccupied him throughout his long career. In the five chapters that make up this volume, Habermas discusses the concept of communicative action and the grounding of the social sciences in the theory of language; the relationship between rationality and the theory of language; discourse ethics; political theory and problems of democracy and legitimacy; the critique of reason and the challenge posed by religion in a secular age. The book will also be publlshed in a French translation by Gallimard.